New year, new salad. Isn’t that how it usually goes? I was big into cauliflower in 2013, and even though that’s like, so last year, I’m sticking with the stuff. I like eating raw florets dipped in Trader Joe’s cilantro & lime yogurt dip (which, for those of you who don’t know, is the bomb dot com), though I also enjoy finding ways to get it all roasty toasty in the oven, too. I’ve got a lot of big, exciting, scary things on the horizon for 2014. There will be a 30th birthday. There will be a cookbook. There may be a trip or two. My stomach is flopping and my fingers are crossed for it all. But today? 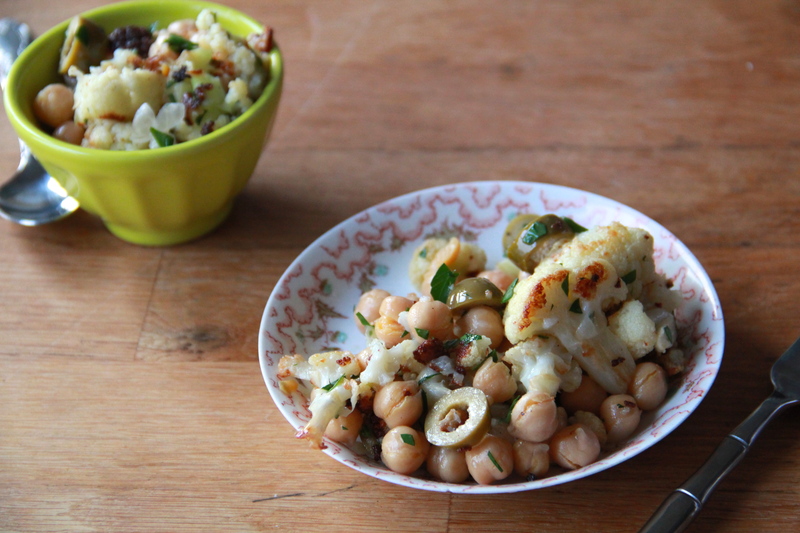 Today, there will be cauliflower and chickpea salad. It’s a start. 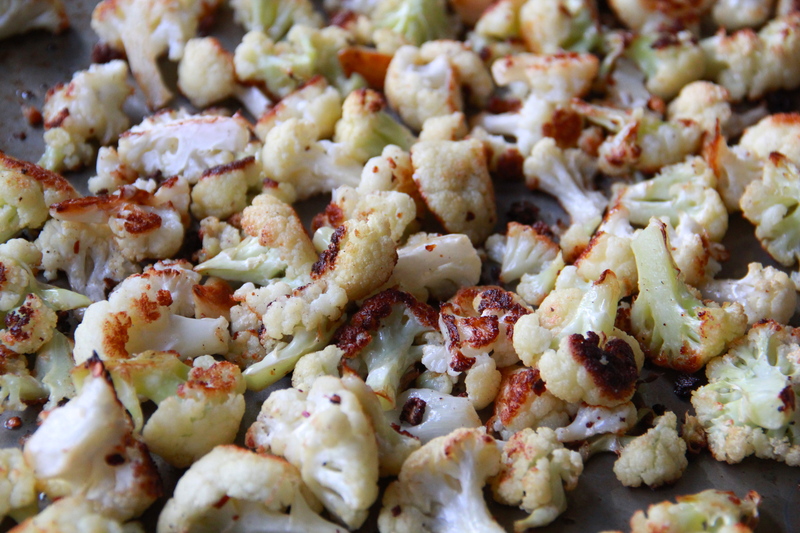 Toss the cauliflower florets with the olive oil, garlic, pepper flakes and salt, and spread out on a sheet pan. Roast the cauliflower until browned and charred in spots, about 20 minutes, stirring the pan halfway through cooking. 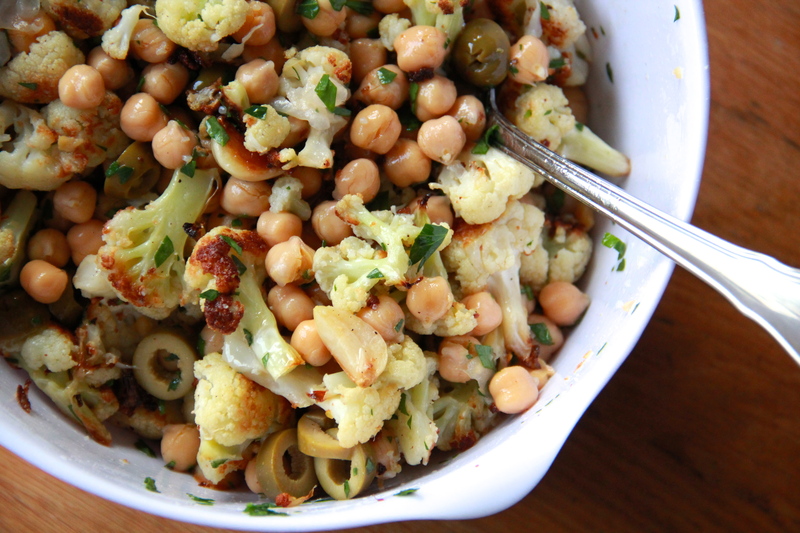 While the cauliflower roasts, combine the chickpeas and olives in a large bowl. 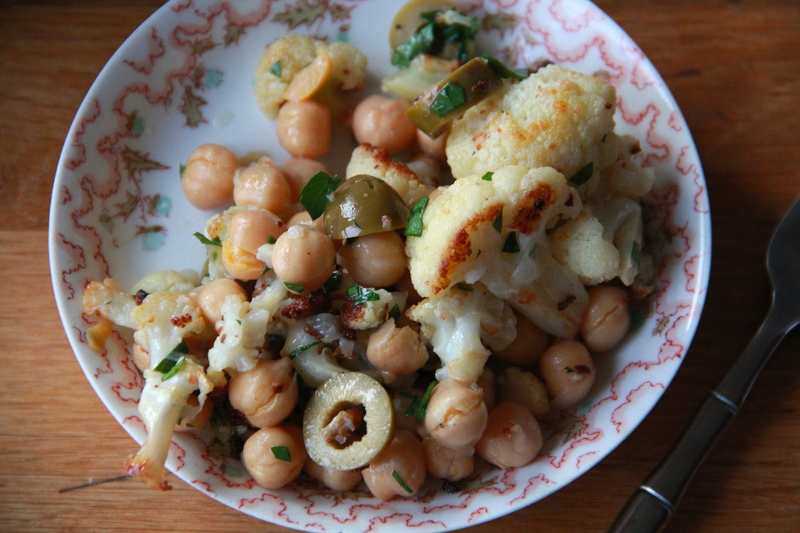 Once cauliflower is roasted, add it, still warm, to the bowl with the chickpeas and olives. Stir in the chopped parsley, lemon juice and sesame oil, and season to taste with extra salt and pepper. The salad will keep, tightly wrapped, in the refrigerator for 3-4 days. Love this salad combo. Great ingredients. Perfect for the new year! Yay cookbook!! I will totally buy your cookbook. And a warm salad not involving greens sounds good right now. Mmm. Resolution salad. Yes! Making this tonight! This salad looks delicious–I can’t wait to try it! But I’m not a fan of green olives…would you recommend substituting black olives or something else or just leaving them out? You could substitute black olives or capers, but if you’re not feeling those you could definitely leave them out. Hope you enjoy! i agree with the lady who celebrates salad without greens! too cold in NJ for feelin’ like greens right now. this shall be the antidote. Mmm I just love roasted cauliflower (mostly the tiny pieces that get super brown…borderline burnt to a crisp). Cannot wait to try it like this! the burny bits are the best! Just made this one. Holy cow! Delish!! !